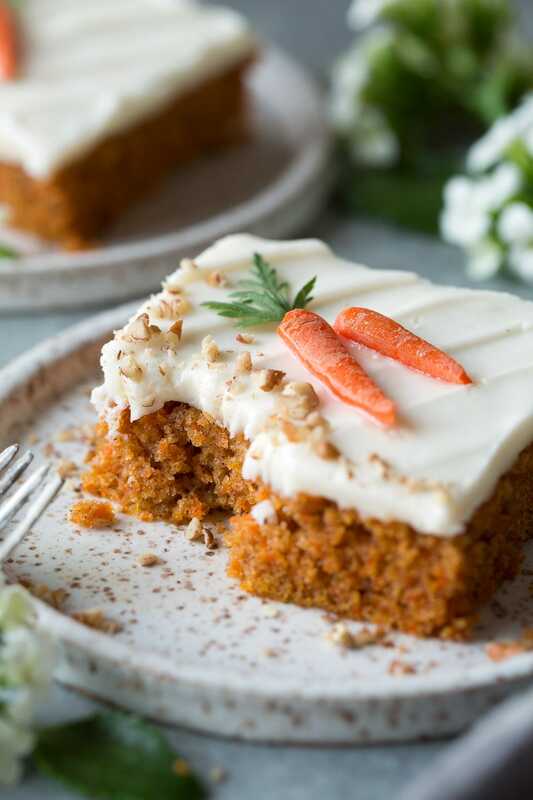 Carrot Sheet Cake with a rich Cream Cheese Frosting is unbelievably delicious and it’s so easy to make that it may just take the place of your favorite layered carrot cake! Plus you get 20 bars (or as much as 24) from this cake so you’ve got enough to feed a crowd, or enough to hide away for the next few days. I’ve been eating this for 3 days in a row and life has been great. 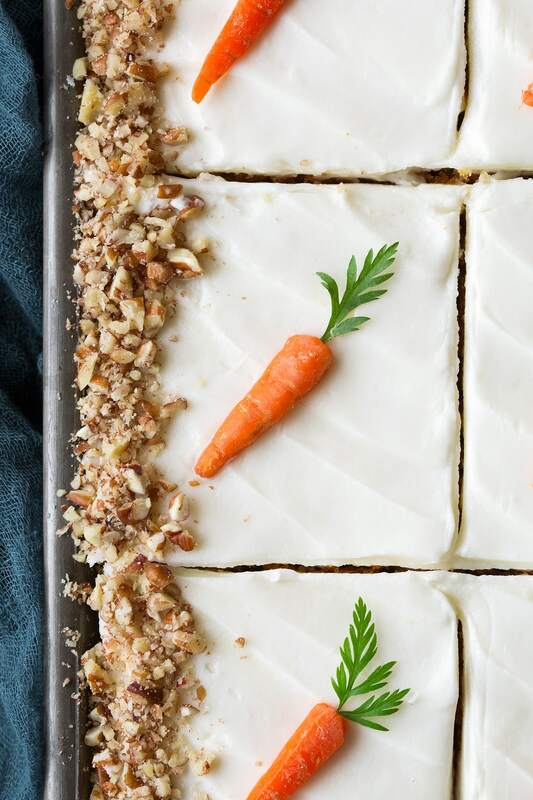 :) It’s pretty much that same Best Ever Carrot Cake but in sheet pan form! 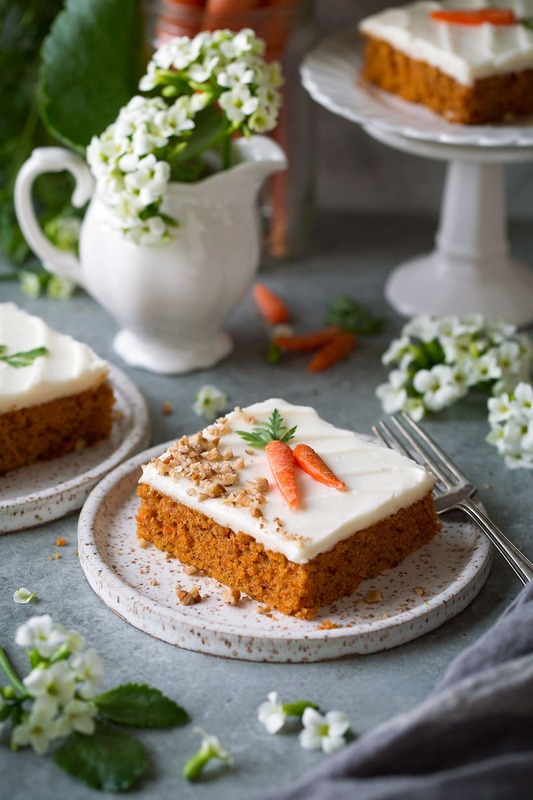 I love this time of year because it means bring on all those different carrot cake desserts (see my long list of them below). 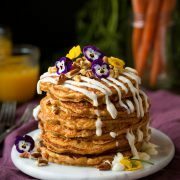 Carrot cake is my favorite kind of cake so I’ve made a lot of variations on it. What’s next, am I missing something?? Maybe carrot cake macarons or ice cream. I’ve made carrot cake probably 100 times by now and that number will just continue to grow and grow. But what I’m saying is by now hopefully I know how to do it right. I want it soft, I want it moist, I want it perfectly sweetened and spiced, and I want a perfectly luscious frosting and that’s just what you get from this cake. Why Use Oil and Applesauce? I like to use a blend of oil and applesauce, that way the cake isn’t overly greasy and do we really need to add that much fat into the batter? Then I reduce the traditional amount of leavening, that 2 tsp baking soda plus 2 tsp baking powder just seems way overkill. Then I like to save the nuts for the very top of the cake vs. mixing them into the batter. I like layers of texture here instead of mixed textures in the layers. 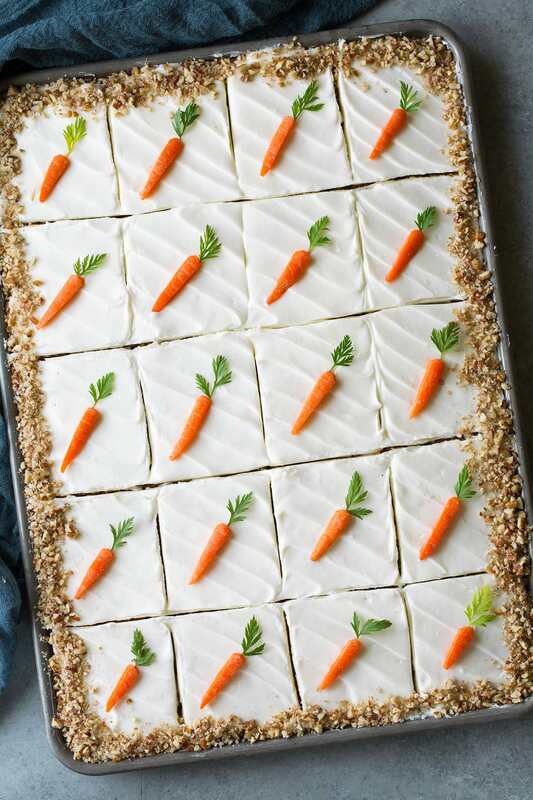 For this Carrot Sheet Cake I only added them to the border because I liked the way it looked, but then of course I had more on the side to serve over each slice. I also think a key to perfect carrot cake is to finely shred the carrots. That insures you’ll get a nice light texture and no strange chunks, it’s all just little hidden pieces that blend beautifully. So break out those muscles and get shredding. No cheating and using a food processor or going for the larger holes on the grater. In the end you’ll be glad you didn’t. Over the years I’ve also tried different decorations on carrot cake. 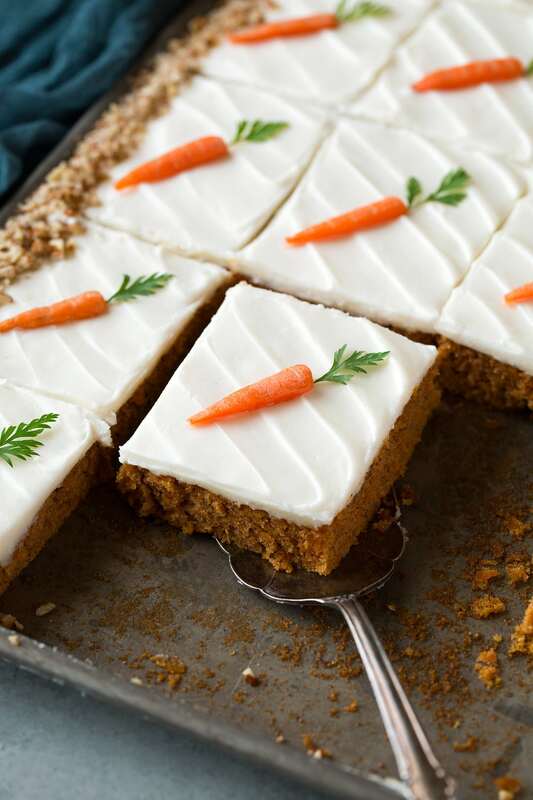 Like the traditional carrots made from orange and green frosting or just a design with the same colors, I’ve also tried Marzipan or fondant carrots, or edible flowers but my latest favorite way is just us use fresh carrots. Not sure why I didn’t really think of it before but obviously real carrots and real carrot tops (which are edible despite common misconception) make make the most realistic and cute design. 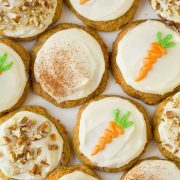 To make them I just slice a side about 1/4-inch thick from the carrot then cut itty bitty mini carrots shapes. To get about 20 it should only take about 5 minutes. Chances are no one is really going to eat them but aren’t they just so fun? And do wait to cut add them until you’re ready to serve because they’ll start to shrivel after about an hour. If you want something people will eat go for the marzipan carrots (I love the taste of that sweet almond paste), that’s my other favorite but much more time consuming vs using real carrots. And if you can’t find the carrots with the green tops attached at the grocery store (which are usually in the organic produce section) them just use some curly leaf parsley instead. This is what I’m planning on making again this year for Easter dinner. It was just too easy and so festive and everyone in my family loves it, especially me! Good thing the cook get’s go choose :). If you are looking for more delicious Easter recipes I recommend my Honey Glazed Ham, Parmesan Roasted Asparagus, Slow Cooker Mashed Potatoes/Mom’s Mashed Potatoes and my favorite Dinner Rolls. Aren’t you just wanting to dive in RIGHT NOW? I know I want another piece! Can I Use Less Frosting? 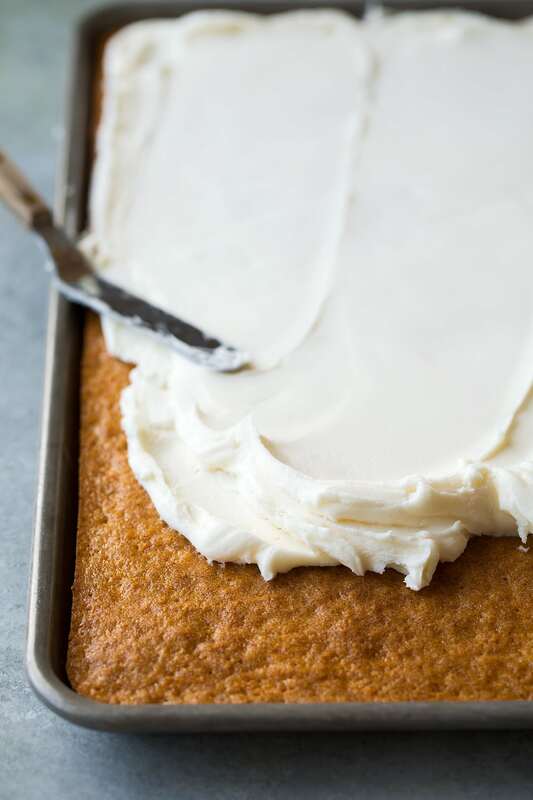 If you aren’t crazy about frosting you can cut it down by 1/3 – using 8 oz cream cheese, 1/2 cup butter, 3 1/2 cups powdered sugar and 3/4 tsp vanilla. It’s just enough to cover the cake and really more of the amount I prefer but I like the look of more so I listed the amounts I used here in the recipe. 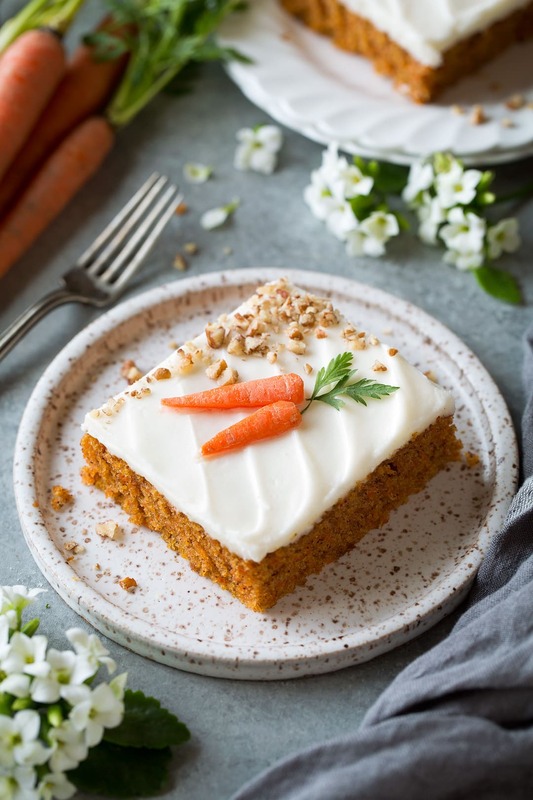 This Carrot Sheet Cake with a rich cream cheese frosting is the perfect dessert for any occasion, especially Easter! It makes enough to feed a small crowd, or enough for your family to have a delicious dessert for the next few days. It's deliciously soft and moist, perfectly spiced and just truly irresistable! Preheat oven to 350 degrees. Spray a rimmed 18 by 13-inch baking sheet with non-stick cooking spray. In a medium mixing bowl whisk together flour, baking soda, salt, cinnamon, ginger and nutmeg for 20 seconds set aside. In a large mixing bowl whisk together granulated sugar and brown sugar while breaking up any clumps of brown sugar with fingertips as needed. Add in oil, applesauce, eggs and vanilla and using an electric hand mixer blend mixture until combined. Blend in flour mixture then mix in carrots. Pour batter onto prepared baking sheet and spread into an even layer. Bake in preheated oven until toothpick inserted into center comes out clean, about 23 - 27 minutes. Let cake cool completely. 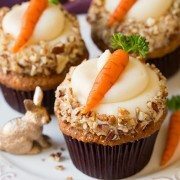 Then frost with cream cheese frosting, sprinkle with pecans and carrot decoration just before serving. In the bowl of an electric stand mixer (or using a hand mixer and mixing bowl) whip cream cheese and butter until smooth. Add in vanilla and powdered sugar and whip until light and fluffy. Jaclyn: I use an offset spatula to wave lines across the cake going one direction (maybe 1/2-inch thick strips), then use the tip of the spatula to draw lines going the opposite direction. Sorry I’m trying to find a video tutorial on what I’m explaining but having trouble finding one. Luv2bake: Everyone loved this cake!!! One person admitted that she really was not a fan of carrot cake until she tasted this cake and has requested that I make it again!